Clay roof tiles are designed with British weather in mind, so that rain collects and runs straight off a pitched roof. But if your tiled roofing goes wrong, you can leave your house open to the elements. If your tiled roofing is in a bad situation, you can rely on our tilers to sort the problem out. Our top priorities are good craftsmanship and customer satisfaction. Trust us to always do our best to protect your home, your family and you. Our roof tilers are reliable, friendly and utterly professional workers. From us, you can always expect the best results. This is why we're confident to offer an extensive guarantee on every single job. Are you in a fix? 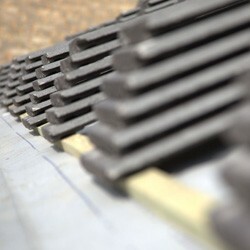 If you need urgent repairs on your tiled roofing, or a brand new roof installed on your property, look no further. If you take pride in your home, call the roof tilers who take pride in their work. We always give our customers the best we can. Call the local tiled roofing experts today on Glasgow 0141 340 9604 for a free, no obligation quote on your tiled roofing work. For roof tilers that you can trust in Glasgow and who offer competitive prices, get in touch! We're waiting for your call!